In my last two posts I covered the process of importing data from StackOverflow and GitHub for the purpose of creating a combined MDM database. Now we get to the really fun stuff: today I show you how I tied the data together! The most obvious entities to link between StackOverflow and GitHub is the user profiles. Unfortuately users don’t always have two profiles, don’t fill out both profiles, or just don’t have perfectly matching information between the two. 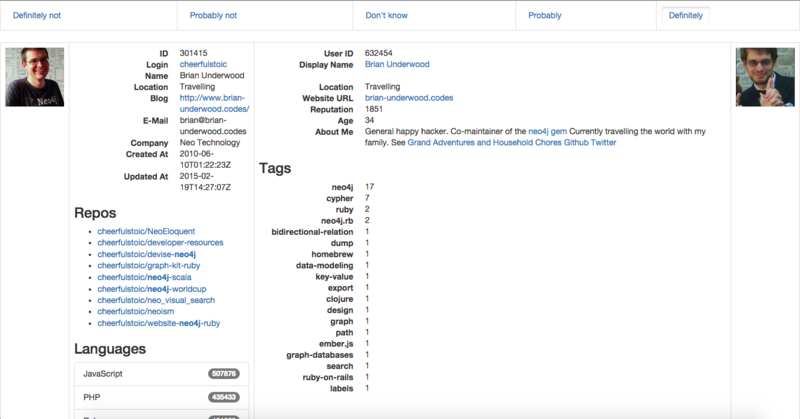 To this end I built record linkage tools which helped me make links between users. All of the above generated properties get downcased, stripped of extra whitespace, and stored without duplicates. with(:domain, count: 'count(domain)').where('count > 1'). With the data standardized we can now easily do record comparison and scoring. Here I go through the millions of combinations of user pairings and give each of them a score. For each pairing I want to create a relationship in the database so that I don’t need to calculate the score again. Since I don’t want to have millions of relationships connecting every single user to every other user, I only create relationships above a score threshold. I created a class called ObjectIdentifier which allows me to create rules for comparing and scoring records. You can see that there are anonymous functions for both fuzzy and exact string matching. 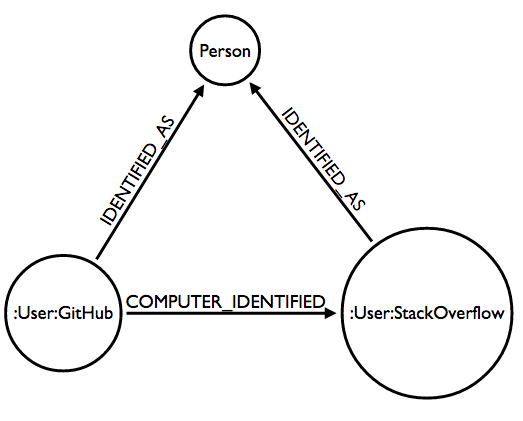 Using the identifier object, I then compare every combination of users between GitHub and StackOverflow. With 2,312 StackOverflow users and 6,255 GitHub users there are 14,461,560 potential pairs, which can take some time. For each pairing my script gets the result hash and calculates a score as the sum of the Hash values. If that score is above a threshold, it creates a COMPUTER_IDENTIFIED Neo4j relationship to represent a hit. The relationship stores the score as well as a hash property with a JSON representation of the result for debugging. While comparing strings to strings I realized there was another aspect of the profile that I was missing: The profile photo. If I could do fuzzy comparisons against the user images I could narrow down the results even further. Fortunately the phashion gem provides an implementation of the pHash algorithm to do just that. So I wrote a quick script to download the profile photos locally and then another to compare the millions of combinations. With all of that downloading and pHashing, I found that I also needed to use the parallel gem to complete in a reasonable amount of time. So that I didn’t need to compare photos during my ObjectIdentifier process, I simply created aSIMILAR_IMAGE_TO relationship between users to store the result of the pHash (a value between 1 and 15 where 1 is the closest perceived match). Using Neo4j I don’t need to worry about table structure or if I should create a collection or embed in existing objects. I can create whatever links between users that I need as I play with algorithms that will work for my purpose. This view would show me a randomly chosen pair of users. 80% of the time those users were chosen because I had algorithmically determined some linkage between them. 20% of the time it would just show me a randomly chosen set of two users which hadn’t already been matched to acts as a control group. I created five links along the top of the page (“Definitely not”, “Probably not”, “Don’t know”, “Probably”, and “Definitely”) and threw in a bit of CoffeeScript to let me choose them via arrow keys. How should do I choose between the five levels? While I placed “Not sure” in the middle, that was a special case which means that I don’t have enough evidence. Should I follow links and otherwise research the users? No. If I want to determine how well my matching algorithms work, I should use only same data that they have. I happen to be a human and humans are pretty good at comparing photos, particularly photos of people. I was torn about this, but decided that if two photos were obviously not the same person, I should classify the profiles as different. This shows me that I should be able to relatively safely classify an ObjectIdentifier score of around 3 and up as the same user. 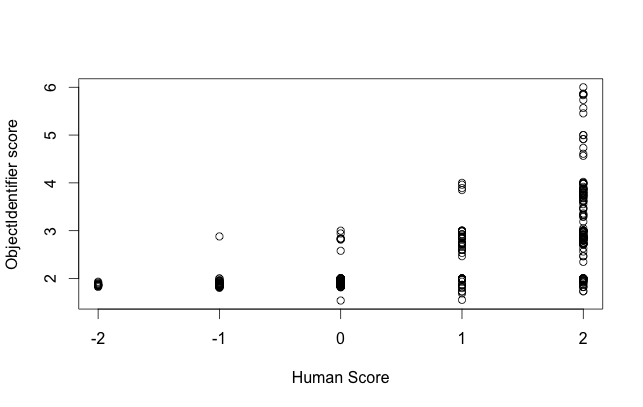 A score of 2.5 and above looks promising, though looking in that range for users with a human classification of Not sure there are some false positives. I suspect I can improve the correlation between the two by adjusting the algorithm scoring/weights. That’s plenty to digest for now, so next time I’ll show the sorts of queries that can be run on the linked database! You can see all the code on the GitHub repository. If you want to talk more in person, feel free to drop by one of my upcoming speaking engagements!